This allows you to eat bigger meals with less food prep, and less worry. You may have heard of Intermittent Fasting (or I.F.). It’s a type of eating that restricts food intake to a small time period each day. Usually a 4 to 8 hour window. While some IF diets recommend going an entire day without eating every week, we don’t see the need to be that restrictive. Besides, you can get all the benefits of fasting without really fasting at all. Studies show that you only need about 16 hours of being in a fasted state to reap the largest benefit of intermittent fasting: autophagy. For pain and inflammation, this is a powerful weapon. By activating your body’s natural autophagy process, you suppress inflammation. You also slow down the aging process and boost natural energy hormones. …So what does 16 hours of fasting look like? 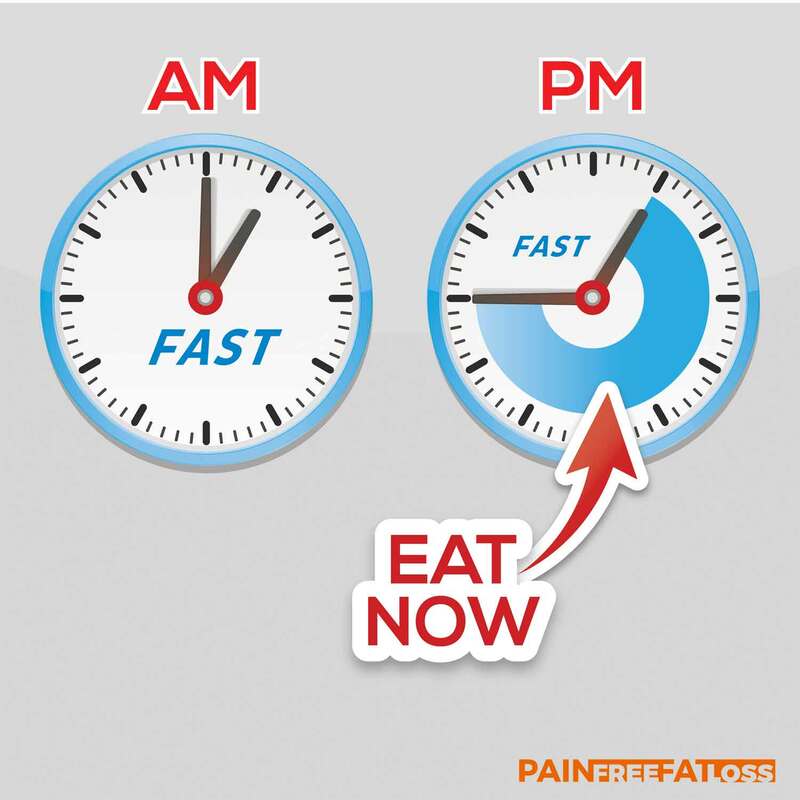 If you have dinner at 7pm, then don’t eat again until 11am the following day… that’s a 16 hour fast. You could also eat your last meal (or snack) at 9pm, then fast until 1pm the following day (a popular setup with our clients). Which means all you really need to do is skip breakfast in order to activate autophagy and reap the benefits of fasting. And, you’ll actually be less hungry on this regimen. Even though most nutritionists say that skipping breakfast is bad for your metabolism, and that you should eat several small meals per day… the science behind that claim doesn’t hold up. This is one of the 3 key strategies we use to help our clients lose weight and lower inflammation. Go here to read about our unconventional strategy for pain-free fat loss. Copyright © Pain-Free Fat Loss.